Tuxedo tails are always the perfect attire for a formal event. 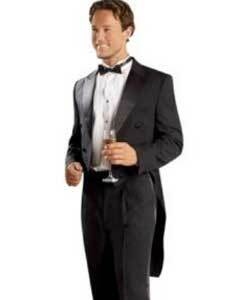 Tuxedo tails are also referred to as tail tuxedos or tailed tuxedos so as not to be confused when you see these terms. 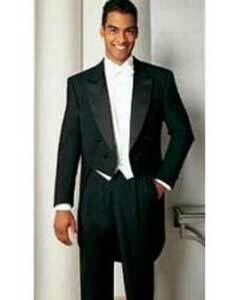 Tuxedo tails traditionally come in black and white but are also available in other colors as well. Tuxedo tails exude the elegance that is required for formal events and should be considered as an option for black tie and white tie events. 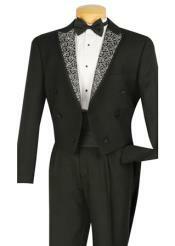 Black tuxedo tails are the epitome of class and style. 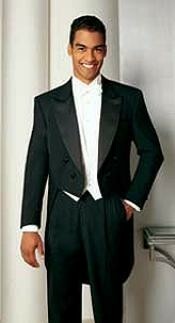 Tuxedo tails have been around for many years and it is because they show class and style like no other tuxedo style on the market. 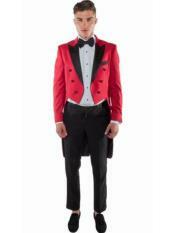 Tuxedo tails come in several styles to fit the most discerning wearer of these fine garments. 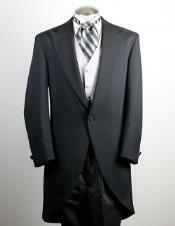 Tuxedo tails come in a peak lapel jacket and a notch lapel style of jacket. 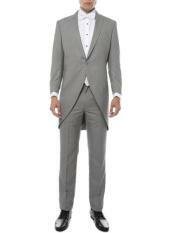 No matter your choice you will be sure to impress everyone at your event with your elegant choice of tuxedo tails! 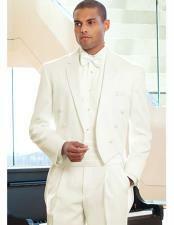 Tuxedo tails are most often worn in black or white colors depending on your event. 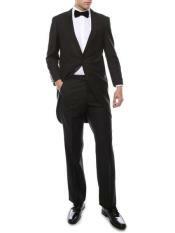 Black tuxedo tails are one of the most traditional and versatile styles of tuxedo ever designed. 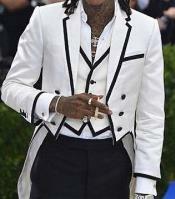 They are a mainstay in the fashion world and should be in every mans closet for that special occasion that you may be invited to at the last minute. 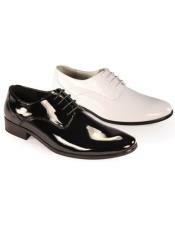 The tuxedo tails of today come in a variety of colors to help you look your best at any occasion. 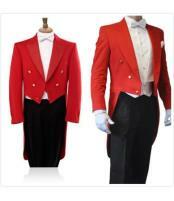 A tuxedo tails sets you apart in the crowd and will do even better in a custom color that is available in tuxedo tails. 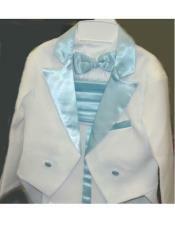 Virtually any color you can think of can be found in a tuxedo tails and if not it can certainly be custom made. 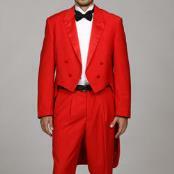 If you must have tuxedo tails in red they are available! 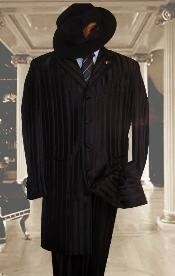 If you need a royal blue tuxedo tails for that special event look no further than mensUSA for all of your needs. How about green tuxedo tails for St. Patrick’s Day? Look no further once again because mensUSA has it in your size! The tuxedo tails can be found in any color you can imagine! Tuxedo tails also come in boys sizes. 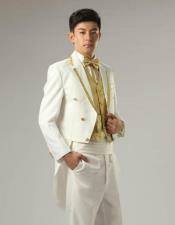 Tuxedo tails for boys are very popular for weddings. What could be more cute than your ring bearer walking down the aisle in his own tailed tuxed? 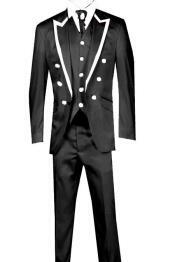 Boys suits are also popular for weddings but why not put him in some tuxedo tails and the elegance will be wonderful. 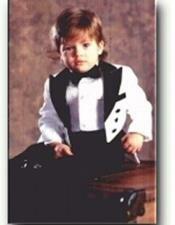 Boys tuxedo tails come in black and white and will have him looking just as good as the adults in your party. 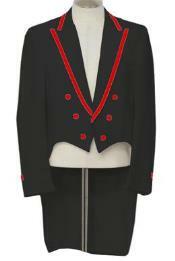 Boys tuxedo tails can be found in a size 2 all the way up to a size 20. As you can see, tuxedo tails can fit anyone regardless of age and should be a consideration for your wedding party or other formal event. Good news! Tuxedo tails are also affordable. 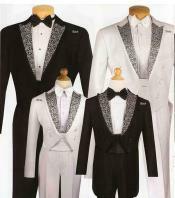 Just because tuxedo tails are elegant they do not have to break the bank. 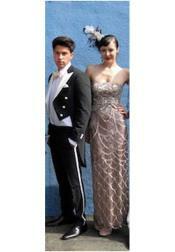 Tuxedo tails can be found from us starting at the low, low price of only $99. 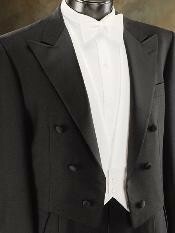 Regardless of your budget the perfect tuxedo tails is there for you to choose and wear with confidence and pride. 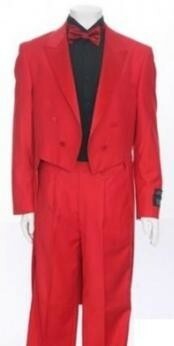 Tuxedo tails will have you looking your best whether you spend a lot or just a little with our large selections of styles and prices. 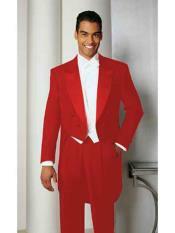 Tuxedo tails also should be dressed up with the many accessories that mensUSA has to choose from. 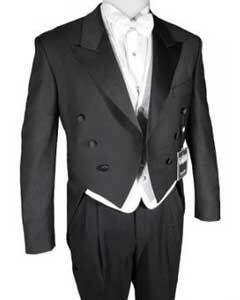 For starters, a tuxedo tail ensemble is not complete without a vest set. 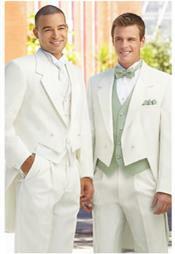 Vest sets can be found in many many colors and styles to customize to your event. 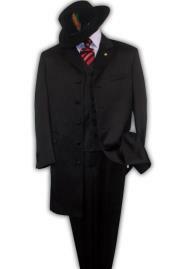 A tuxedo tails suit is not complete without a satin vest and tie set in the color that you need for your event. You will have no problem matching the event colors with the large selection of colored vest sets that we have here at mensUSA. 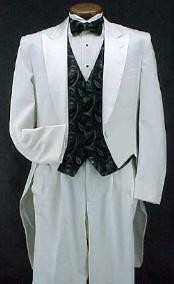 And don’t forget your tuxedo shirt to look your best as no ordinary dress shirt will be enough in your tuxedo tails. 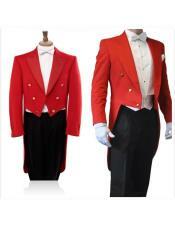 Last but not least if you want the true refined gentleman look why not pair up your tuxedo tails with one of our top hats!